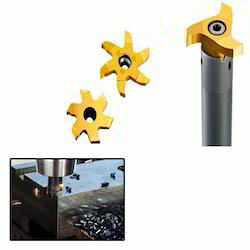 Leading Manufacturer of groove milling cutters for steel industry from Chennai. We are among the reputed organizations, highly engaged in providing a premium quality range of Groove Milling Cutters for Steel Industry. Our offered cutter is widely acknowledged among our clients for its specific usage in various engineering industries. The provided cutter is precisely manufactured using the quality grade raw material and modern technology. This cutter is available in different variety of specifications, and it can be availed at most competitive price. Looking for Groove Milling Cutters For Steel Industry ?